Rock Resurrection Art : Star Wars guitar pick earrings now available! 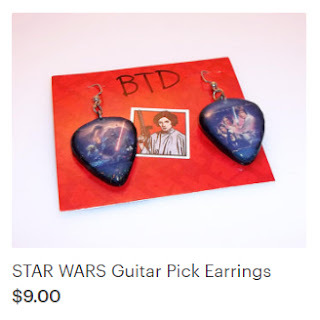 Star Wars guitar pick earrings now available! Sturdy galactic black guitar pick pendants painted with holographic glitter! Each earring shows a different side of the force, on the back is a star and the title "Star Wars." Even the red backing has the Star Wars logo with a Princess Leia sticker!